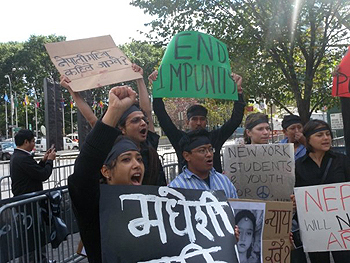 Nepali students in New York call for end to impunity of government crimes (Photo: Alice Speri). Some 30 people gathered at the U.N. Plaza on Saturday to demand the Nepali government honor its commitment to drafting a fair and inclusive constitution. The demonstration, organized by Nepali students on the occasion of Prime Minister Madhav K. Nepal's participation in the U.N. General Assembly Summit, was the first in New York since the country transitioned from monarchy to federal republic in 2007. A lot has changed in the past few years, but Nepalis are still awaiting equality and justice for the country's ethnic groups as well as government transparency and political representation for all. Erisha S. Suwal, a graduate student at Columbia University and one of the protest's organizers, said that, in 2005, she had attended a demonstration at the U.N. against the then King who dismissed the government to quash the rising demands of the country's Maoist movement. "We need to show that we don't agree with what is happening now either," Suwal said. When she learned that Nepal's prime minister was coming to New York, Suwal said she was surprised to find out that groups that had previously protested the monarchy were not organizing any demonstration. "We want to remind people that the reasons why they protested in the past are still there." Demonstrators held signs calling for a fair constitution, civilian rule and investigations into a series of political disappearances. A poster called for justice for Maina Sunuwar, a 15-year-old girl tortured and killed by the Nepalese army in 2004, a disputed case still awaiting resolution. "Nepalis everywhere want to move forward but we are held back by the same people who are supposed to lead us into a better future," read the flyers protesters handed out at the rally. "The old politicians, the creators and the beneficiaries of the old system, are pushing Nepal into another civil war and political stagnation." The demonstrators protested peacefully, chanting slogans and singing "gaun gaun bata utha," a song that characterized the 2006 People's Movement, which led to the end of the monarchy. The students repeatedly clarified that they gathered as concerned citizens only and that they are not affiliated to any party. "We are not here against this party or against this person," Suwal said. "We are here in support of certain values, the same values that inspired people in 2006." It is uncertain how many Nepalis live in New York, but a majority is concentrated in Queens, where the protest's organizers recruited participants. Suwal said the group received mixed reactions from the public, as some members of the diaspora have lost interest in home politics, and others were concerned by the group's requests, which they thought similar to those of the Maoist movement. Despite reiteration that the protest was unpartisan, the protesters' calls for independence from Indian intervention and demands that the government respect democratic elections—which the Maoists won in 2008—did resonate with the Maoist party's language. "But we are criticizing all political parties, we criticize the wrong actions of each," Pennsylvania-based Ekta Ghimire said. Ghimire added that Nepal has a history of not honoring people's vote and added that she does not support any current leader. "That's the problem right now, that we don't have any able politician to lead the country," Ghimire said. A temporary constituent assembly is supposed to complete Nepal's constitution by May 2010, as agreed in the 2006 Peace Agreement that concluded the Maoist-led People's War. Demonstrators, however, fear the document will not be drafted on time, which could lead to the Prime Minister calling for an indefinite state of emergency. "It doesn't look like it's gonna happen," Prabhas Pokharel, a Harvard University graduate currently working at a non-profit, said in reference to the constitution. Pokharel, who directly questioned the prime minister on the matter at a panel held last Thursday at Columbia University, said he does not trust him. "This is not the way to write a constitution, without discussing the actual issues of how we are gonna respect minority rights, how we are gonna give women their rights. Without this discussion you can't write a progressive and fair constitution in time." Organizers hope the demonstration will remind Nepalis everywhere that they have to take an active role in holding their government accountable for its promises. "It's very saddening that even educated people totally misunderstand the concept of democracy," participant Anil Shahi said. Shahi, who has lived in New York for about 20 years but hopes to return to Nepal soon, said many are afraid to express their concern. "They say we have no right to protest, but they're just being subservient," he said. Demonstrations against the government are not uncommon in Nepal, but they are usually affiliated to a party or an ethnic interest group, and often lead to violence. Shahi said the Nepali diaspora wants to set a different example and call for a unitary engagement in the country's future. "This event is to send a message to everyone at home that we can still dissent peacefully, without burning tires, without throwing stones." Alice Speri is a graduate student at the Columbia Journalism School who also works as a freelance reporter.